Just Sold! 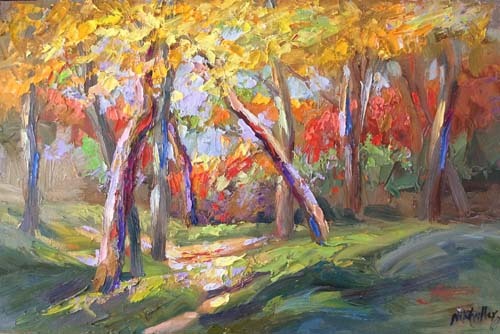 I created "Exploring the Woods II" on another beautiful day this fall at one of my favorite painting spots near our home. The kaleidoscope of autumn colors was ablaze, and I was attracted to the dappled light sneaking through small gaps in the forested canopy, illuminating the winding path and brilliant grasses below. Playing off of the diagonal shadows on the ground and the zig zag arrangement of the trunks, I feel like the patterns create a kind of rhythm, adding to the sounds in the woods in this canvas. 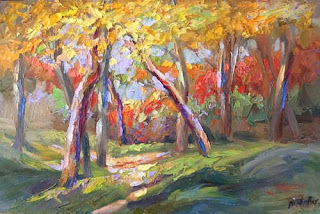 Painted with palette knife and thick oil paint, this landscape is filled with color, movement and energy! If you'd like more information or a brochure on one of our upcoming Plein Air Painting and Photography Workshops, please let me know. For more details, e-mail Niki@NikiGulley.com or go to nikigulley.com/artreks. For more information on my textured contemporary landscape paintings, please e-mail Niki Gulley. Or, check out my website at: nikigulley.com.